Grand Central Publishing, 9781455501373, 288pp. A punch-drunk memoir in which Everyone's Favorite Questlove tells his own story while tackling some of the lates, the greats, the fakes, the philosophers, the heavyweights, and the true originals of the music world. He digs deep into the album cuts of his life and unearths some pivotal moments in black art, hip hop, and pop culture. Ahmir "Questlove" Thompson is many things: virtuoso drummer, producer, arranger, Late Night with Jimmy Fallon bandleader, DJ, composer, and tireless Tweeter. He is one of our most ubiquitous cultural tastemakers, and in this, his first book, he reveals his own formative experiences--from growing up in 1970s West Philly as the son of a 1950s doo-wop singer, to finding his own way through the music world and ultimately co-founding and rising up with the Roots, a.k.a., the last hip hop band on Earth. Mo' Meta Blues also has some (many) random (or not) musings about the state of hip hop, the state of music criticism, the state of statements, as well as a plethora of run-ins with celebrities, idols, and fellow artists, from Stevie Wonder to KISS to D'Angelo to Jay-Z to Dave Chappelle to...you ever seen Prince roller-skate?!? But Mo' Meta Blues isn't just a memoir. It's a dialogue about the nature of memory and the idea of a post-modern black man saddled with some post-modern blues. 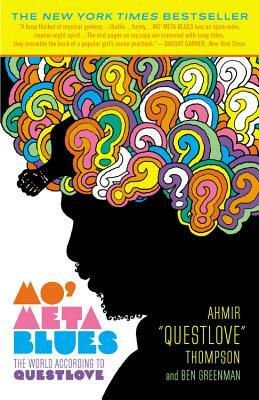 It's a book that questions what a book like Mo' Meta Blues really is. It's the side wind of a one-of-a-kind mind. It's a rare gift that gives as well as takes. It's a record that keeps going around and around. Ahmir "Questlove" Thompson is the drummer and co-founder of the Grammy award-winning hip hop band The Roots. He's also a world-renowned producer, arranger, songwriter and The Tonight Show with Jimmy Fallon bandleader. Ben Greenman is an editor at The New Yorker and author of several acclaimed novels, including Superbad, Please Step Back, and The Slippage. As a journalist and critic, he has written widely on music and pop culture. "MO' META BLUES isn't just a memoir. It's a dialogue about the nature of memory and the idea of a postmodern black man saddled with some postmodern blues. It's the side wind of a one-of-a-kind mind. It's a rare gift that gives as well as takes. It's a record that keeps going around and around.